Lil' Inker: Design Team Reveal Day 7! Design Team Reveal Day 7! Good morning!!! I'm back with another exciting Design Team reveal! This designer really caught my attention with her application and loads of amazing projects she posted recently using Lil' Inker products. I was also very impressed with her work for The Twinery. When I saw how creative she was I just knew there was a spot for her on the team. 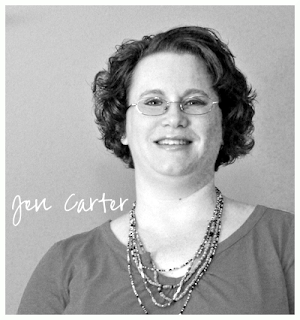 Please welcome Jen Carter of Jen's Ink Spot. I am a stay-at-home mom to two children. My son is 9 and going to be in the 3rd grade and my daughter is 3. My husband and I recently celebrated 14 years of marriage! We live in a small rural town in Kansas where my husband is the Lead Pastor at our church. I am very involved at the church and am the Director of the Women’s Ministry. I started scrapbooking way back in Junior High school and continued through my son’s 2nd birthday. At that point I was a little burnt out on making everything boy themed so I turned to card making as a way to broaden my paper crafting options. I enjoyed the freedom of being able to use pinks & purples and flowers in my art, as opposed to the blues and greens and trucks and tractors from my son’s scrapbooks. I still scrapbook from time to time but most of my projects revolve around card making. I love to paper craft and consider it a passion. I am so excited to be a part of the Lil’ Inker Designs team! Welcome Jen!! I am beyond thrilled to have you as a member of our team! Please stop by and visit Jen at Jen's Ink Spot and welcome her aboard! See you tomorrow with our final Design Team reveal!!! Love having you I'm the team. So excited to get to know you better and see more of your beautiful work!